A post in the social media platform Twitter caught my attention on 16th of December, 2013. 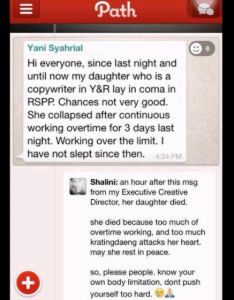 It seemed to be a screenshot of a Path post, containing a screenshot of Whatsapp (or SMS) from Yani Syahrial, an Executive Creative Director from an advertising agency in Indonesia. I didn’t even look in the comment section, I know something bad has happened; we might have lost a creative colleague. And unfortunately, I was right, she died even before that post was posted. It caused an outrage in the social media, be it Twitter, Path, or even their predecessor, Facebook. All of them can easily be traced with #RIPMita, mourning the loss of Mita Diran. Most of the outrage is a simple sympathy tweet “RIP Mita”, or “RIP @mitdoq”. Her last tweet in that said twitter account was “30 hours of working and still going strooong”. That particular tweet was retweeted hundreds of times, being used in numerous news websites, and quoted by thousands of twitter users. The twitterverse is divided into two factions, one that mourned for Mita purely (with or without knowing her personally) and one that mourned for her while blaming the company and/or the industry. Why are the company and/or the Industry being blamed? Because apparently, it has been a known secret that advertising workers often worked late, even a little too often. 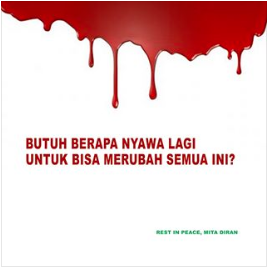 A twitter account even stated that “if you want to know what the extreme capitalists have done, check out #RIPMita”. And another one stated, “I hope the agency world now realized their workers’ worth”. A Facebook post, posted in a group of advertising agency workers, stated: “How many more lives will it take to change all this? 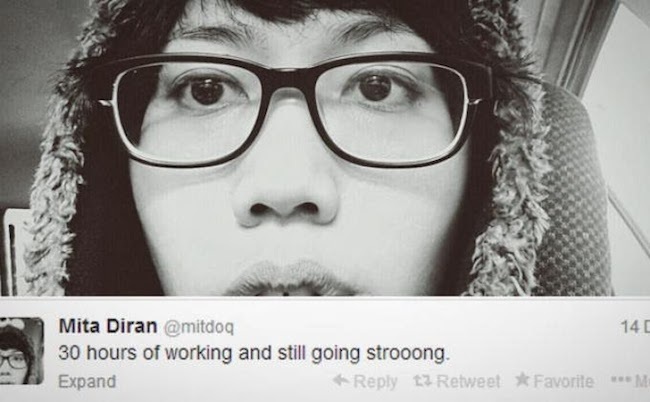 RIP, Mita Diran”, showing a bitter cry for a change, towards a healthier work life. 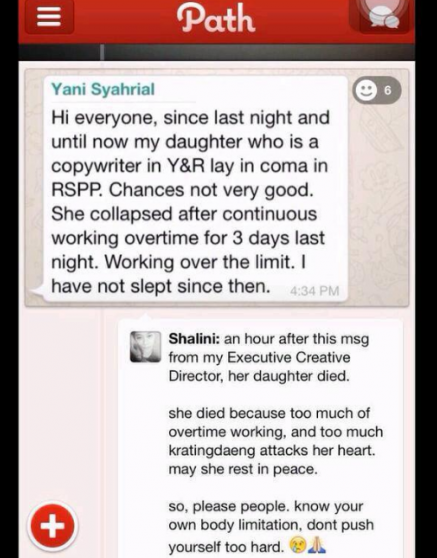 This case quickly reminded me of the death of Li Yuan, another advertising worker in Ogilvy and Mather China. This case, and Li’s case, are two cases in which overworking in advertising agency has been a suspect of being the culprit. As a worker in an advertising agency myself, I can only say that working in the advertising industry is like a roller coaster. Sometimes, when the workload is heavy, doing overtime is almost inevitable. But when the workload is reasonably light, we can hardly find anything to work on. This case should open our eyes that being a worker, in whatever field of work, require a sense of self-control. The workers will have to pace themselves accordingly, for no one knows a person better than him/herself. The company will have to take a little closer look towards their employees, their history of health and well being, to be specific. The clients? Well, omitting the fact that they have their own industry (not the advertising industry), I think they still have to start putting sense on the timeframe they created. Asking for an ad worth 80 work hours in a workday is not the definition of “working it”, but closer to the definition of “pushing it”. Regardless of the fact that “overtime” is inevitable in almost all fields of work, we should all agree in one thing: “love yourself, no work is worth your life”. RIP, Mita Diran.